Absolique GRN – Grow. Revitalise. Nourish. is specially formulated with vitamins and synergistic ingredients that have antioxidant and anti-ageing properties that can address hair loss, hair thinning, and healthy hair by enhancing hair growth. 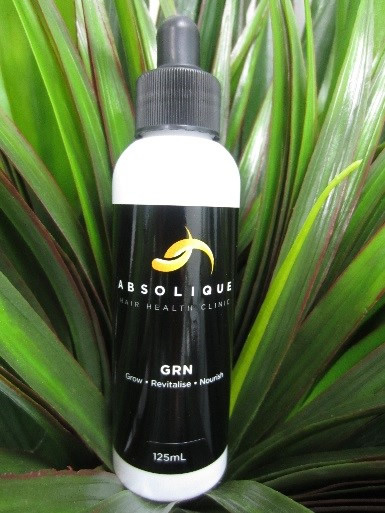 Absolique GRN also contains ingredients that promote natural absorption, improve blood flow, moisturise and hydrate, are antibacterial, calm irritation and itchiness, support skin, reduce inflammation, encourage cellular renewal process, regenerate collagen and elastin and assist natural hair pigmentation. Absolique GRN delivers a positive result on various types of Hair Loss and Hair Thinning problems when used after Correct Diagnosis. Absolique GRN delivers a positive result on various types of hair loss and hair thinning problems when used as directed after scalp preparation with Scalp Brush Therapy and Absolique Scalp Cleanser. However will deliver a better result when used in Combination Therapy including the addition of but not limited to Absolique Scalp Tonique and Microneedle Therapy. Always remember diagnosis is the key and the first step to any successful Hair Loss Treatments. Apply 2-3 ml Absolique GRN to wet scalp after recommended scalp preparation. Use tip of applicator eye dropper to section through hair. Be careful not to get GRN on the hair. GRN is specifically for the scalp and could leave a residue on hair if too much is used. GRN should be applied all over the scalp to help with the hair cycle and hair growth but can also be used in patches and patterns when directed. Style hair as usual. Consult with your Trichologist before using GRN for your recommended scalp preparation when treating stubborn hair loss or hair thinning or if symptoms persist after 4 months. Shake before use. Absolique GRN – Grow . Revitalise . Nourish is FREE from ingredients that can harm your health. Note some ingredients have precautions when taken orally. Applied topically as directed will not have any harmful effects.